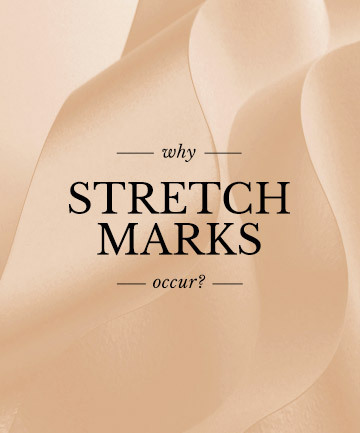 Why Do Stretch Marks Occur? Before we dive into stretch mark creams, here's what you need to know: When you quickly increase in size, you stretch the elastin in your skin (located in the dermis) and that ultimately causes it to break down. "Think of it as pulling a rubber band," says Murad. "If you keep stretching and stretching, it doesn't come back to the same shape." As for improving their appearance, any marks that have turned white are sadly ones you may need to learn to love. "But if stretch marks are relatively new (usually dark in color), you should see results within three months of daily application," Murad says. If the marks are white and have been around for years, that means the skin has undergone more or less permanent damage. (But remember, it happens to a lot of us.) "[At that point] I'm not sure a cream can do a lot of good, though it's worth a try," says Murad. "It may take five to six months to show results." Now that you've gotten the lowdown on stretch marks, it's time to dive into testing stretch mark creams. Do they really work? Let's find out.